Woolf Works Curtain Call. ©2017 Queensland Performing Arts Centre Brisbane. Photography by Darren Thomas. There are occasional opportunities to support The Royal Ballet on their international tours. We will be taking a Supporters’ Tour to Los Angeles from 4–15 July 2019 during which the Company will perform Kenneth MacMillan’s powerfully dramatic Mayerling and a mixed programme of Wayne McGregor’s work. The Royal Ballet will perform together with Company Wayne McGregor and the world-renowned LA Philharmonic. 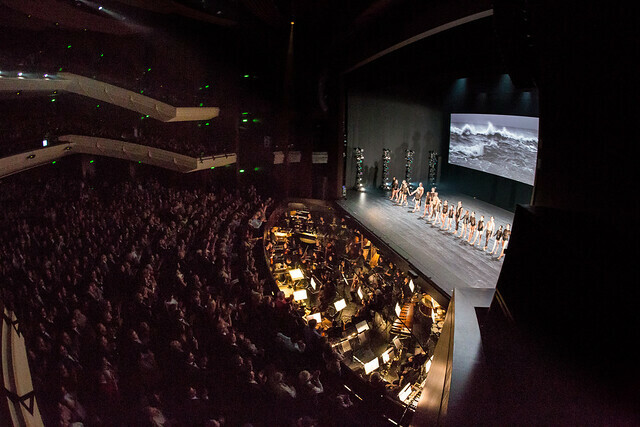 This mixed programme will be an opportunity to see the world premiere of the first part of McGregor’s new full-length ballet, featuring a commissioned score by leading composer Thomas Adès and designs by acclaimed British artist Tacita Dean. Both of these performances will take place on the spectacular stage of the Dorothy Chandler Pavilion in the Los Angeles Music Center, one of the three largest performing arts centres in the United States. In addition to seeing Company dancers behind-the-scenes in class, during rehearsals and at performances, tour supporters will experience cultural excursions into Los Angeles and the surrounding areas. We are incredibly grateful for the support we receive to go on tour each year. We would be unable to take the work of The Royal Ballet abroad were it not for our small group of very generous supporters who accompany us. In addition to transporting the dancers, costumes and sets, we also need to hire an orchestra and technical crew in each location we visit. If you would like to secure a place on the tour or would like further information please contact David Brownlie-Marshall at david.brownlie-marshall@roh.org.uk or on +44(0) 207 212 9448.